We all know there are lots of other people out there with diabetes, but who are those people? How do they deal with their diabetes? What challenges have they faced, and how? Diabetes Self-Management talks with one of the millions of Americans with diabetes to uncover both the common threads of living with diabetes and also what sets Joe Eldridge apart. 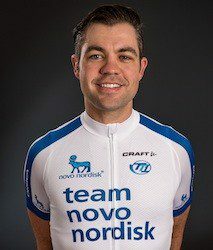 Joe Eldridge currently serves as a mentor for young cyclists on the Team Novo Nordisk development squad. A former U.S. track national champion (team pursuit, 2012), Eldridge rode professionally for seven seasons and says he doesn’t let diabetes hold him back and doesn’t use it as an excuse for anything. DSM: You were diagnosed at age 10. How does a young athlete handle that news? JE: Finding out I had diabetes was a shock. 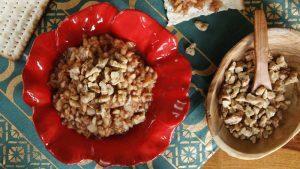 I was going to have to completely change my daily routine in order to best manage my diabetes: I would have to check my blood sugar several times per day, take insulin multiple times, eat my meals and snacks on a schedule, and always carry food with me. I found it difficult to accept all of these new responsibilities. Yet, the diagnosis was also a relief because I learned why I was feeling off. In the months leading up to my diagnosis, I did not want to be an athlete — I didn’t want to do anything. When I was still in the hospital, my doctor, who also had Type 1 diabetes, told me I would still be able to play sports as long as I managed my diabetes. It was great for me to hear I could go back to doing my normal activities. It also helped to hear directly from someone with diabetes who had gone through a similar experience. DSM: How do you deal with the ups and downs of a chronic condition? JE: Diabetes can seem like a job where you never get a vacation, or even a weekend off. I think the key to managing the mental side of diabetes is finding the right people to talk to about the challenges you face. I found that diabetes-focused charities, where you can become involved and volunteer, helped me. They are great places to find other people with diabetes so you can connect and build friendships. Diabetes is also a family condition. For me, that means my wife is involved and needs to be aware of what is going on with me. DSM: Does your self-care change on race day? JE: I aim to avoid changing things on a race day. I try to make each day that I’m training or racing the same for my diabetes management. This helps to take as many variables as possible out of the equation. I don’t ever try anything new on a race day. Sometimes nerves can affect you on race days, and other stresses are added to the equation. These factors can be challenging, and I don’t want to add more challenges by trying out a new routine. DSM: What inspired Team Type 1? JE: A simple friendship. I met Phil Southerland at a collegiate bike race, and neither of us had ever had a friend with diabetes. It progressed into us supporting, encouraging, and challenging each other with our diabetes management. I don’t think in the beginning either of us thought our friendship would be the foundation of a team of athletes with diabetes trying to inspire and encourage others affected by diabetes. The team evolved over the years, and in 2012, Team Novo Nordisk — a global team of cyclists, triathletes, and runners, spearheaded by the world’s first all-diabetes professional cycling team — was formed. DSM: What are your goals with Team Novo Nordisk? JE: To help guide the next group of athletes with diabetes to achieve their goals: the development team, our team of young riders who want to become professionals. Hopefully, their learning curve will be shortened by learning from the mistakes and successes I experienced. I was fortunate enough to race as a professional cyclist for seven years and travel the globe — I hope I can impart some wisdom to the younger generation of Type 1 athletes. The team mission to inspire, educate, and empower people affected by diabetes is very important to me.